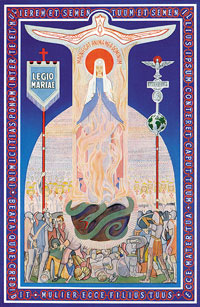 The Legion of Mary was founded in Dublin, Ireland on 7 September 1921. It is a holinelay catholic organisation whose members are giving service to the Church on a voluntary basis in almost every country. The object of the Legion of Mary is the glory of God through the holiness of its members developed by prayer and active co-operation in Maryâ€™s and the Churchâ€™s work. The great thing about the Legion is that there are two different levels of involvement. First there are active membership. Active members carry out a weekly apostolic work in the spirit of faith and in union with Mary and attend regular weekly meetings. However, if you’re unable to undertake active duties there is an auxiliary membership. These members provide spiritual support for the Legion through the daily recitation of the Rosary and the Legion prayers. Rooted firmly in prayer, the Legion is organised on the model of an army, a spiritual army. The commander of this army is our Blessed Mother, with whom we work to bring souls closer to her Son, Jesus.